You know that Thai rolled ice cream thing that went viral on Facebook about two years ago? Sweet Cup in Garden Grove has people waiting in line for hours to try their take on the trendy treat. And all they had to do was put it in a taco. Originally only served on Tuesdays, Sweet Cup’s Waffle Taco has become a fixture on its menu. The taco shells come in red, blue, purple, and black—your choice, dude. 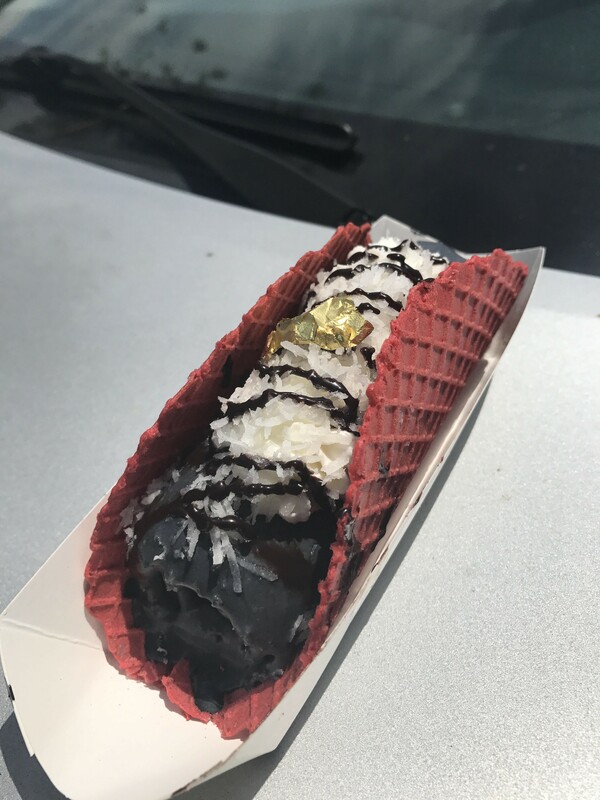 The 24K (one of eleven made-to-order options offered) is coconut-charcoal ice cream topped with sweet shredded coconut, drizzled chocolate, and garnished with a square of edible gold foil. After a quick pic for the ‘gram, take a bite. The shell adds just the right amount of crunch. The ice cream tastes similar to a frozen Mounds bar, but better. The saccharine coconut is balanced by the cool charcoal, and the chocolate drizzle works as a tangy salsa. And the gold foil? Just for show, much like the blackboard emblazoned with #tacotuesday. Because here at Sweet Cup, EVERY DAY is Taco Tuesday!